Cabbage Steaks are a delectable easy low carb option. You can serve as a side with Lemon Pepper Chicken or Beef Bulgogi (Korean Beef). Better yet make a whole meal out of these amazing treats. They can be prepped and in the oven in a matter of minutes. The older I get the more I love cabbage. There are so many cool ways to prepare it and it is pretty easy on the pocket book too. On a side note does anyone really say pocket book anymore? LOL! I don’t think so. Oh well back to the roasted Cabbage Steaks. 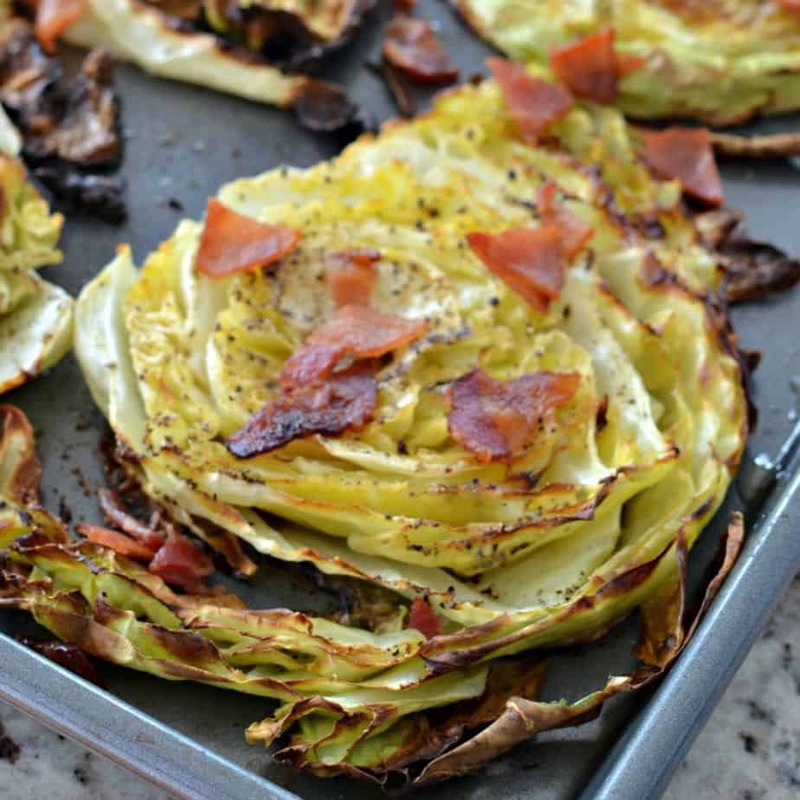 They are one of my favorite ways to prepare cabbage. I can have them prepped and in the oven in about five minutes. Even my picky son loves these and asks for them quite often. These low carbohydrate high fiber healthy vegetable steaks are delicious served with any number of main course entrees including chicken, steak, fish, pasta or even with a fresh fruit cup or a bowl of light soup like gazpacho. 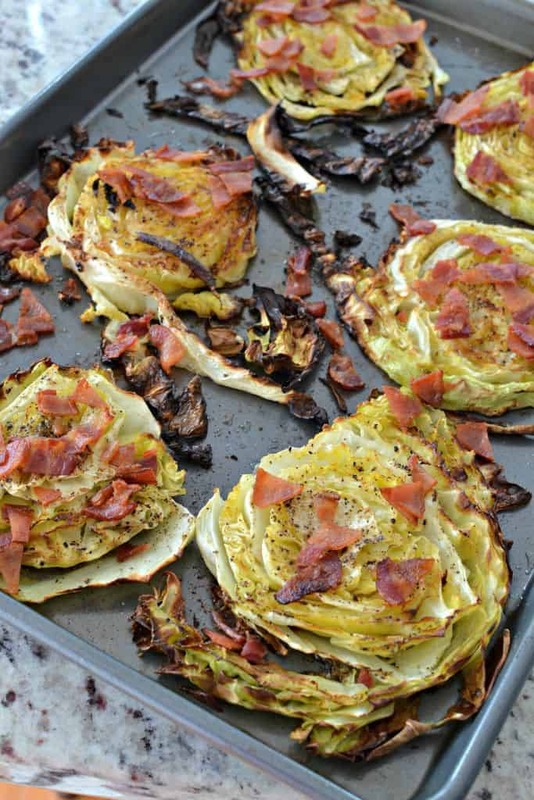 You simply can not go wrong with these simple Cabbage Steaks. How do you make Cabbage Steaks? First place the bacon on a large baking sheet. Cook until crispy flipping halfway through. Meanwhile slice the stem end off the cabbage and discard. Place the cabbage cut side down on a cutting board. Slice the cabbage into 3/4 inch steaks. Once the bacon is cooked remove to paper towels to drain. Do not remove the bacon grease from the baking sheet but make sure that the grease is cool enough for you to place the cabbage steaks on without getting burnt. 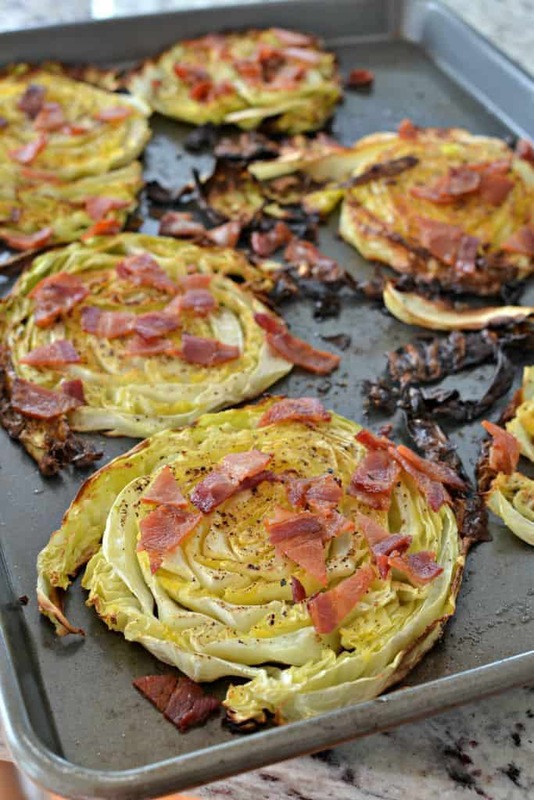 Place the cabbage steaks on the baking sheet and brush the tops with olive oil. Sprinkle with sea salt, fresh ground black pepper, garlic powder and onion powder. Bake for about twenty minutes or until crispy on the edges and soft. 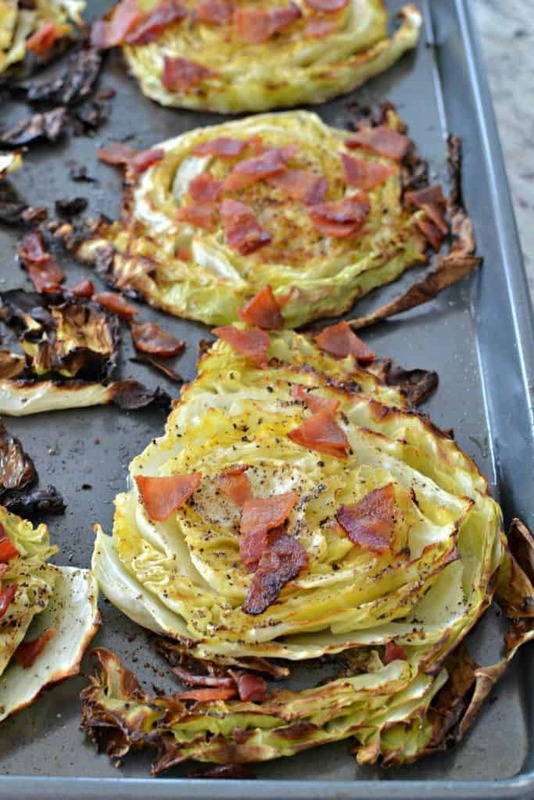 Coarsely chop the bacon and add to the Cabbage Steaks the last couple minutes of cooking. Can you use red cabbage to make Cabbage Steaks? Yes you most certainly can and now that you mention it having a combination of both colored cabbage steaks would make for a beautiful presentation. You can substitute red cabbage in almost every recipe that you use green cabbage. Both red and green cabbage taste the same. The only exception is that if you are preparing a mixed recipe with cabbage in it like a salad the red cabbage will discolor the other ingredients in the recipe. Cabbage is a low calorie vegetable that is high in vitamins, antioxidants and minerals. One cup of raw cabbage has about 22 calories, 54% of the recommended daily intake of vitamin C and 85% of the recommended daily intake of vitamin K. It is also fiber rich and contains powerful antioxidants. So get on the stick and make yourself some of my many delicious cabbage recipes. Can Cabbage Steaks be made ahead of time? Yes they can although they are at their best straight out of the oven. There are times when hubby is running late getting home from work and the kids still need to be feed on time so they can get off to bed for school. I have popped these in the microwave to reheat for about thirty seconds at a reduced power and he devours them like there is no tomorrow. So in short if you love cabbage like we do than give these easy Cabbage Steak Recipe a whirl and let me know what you think. Make your family a healthy side dish or full meal of these. 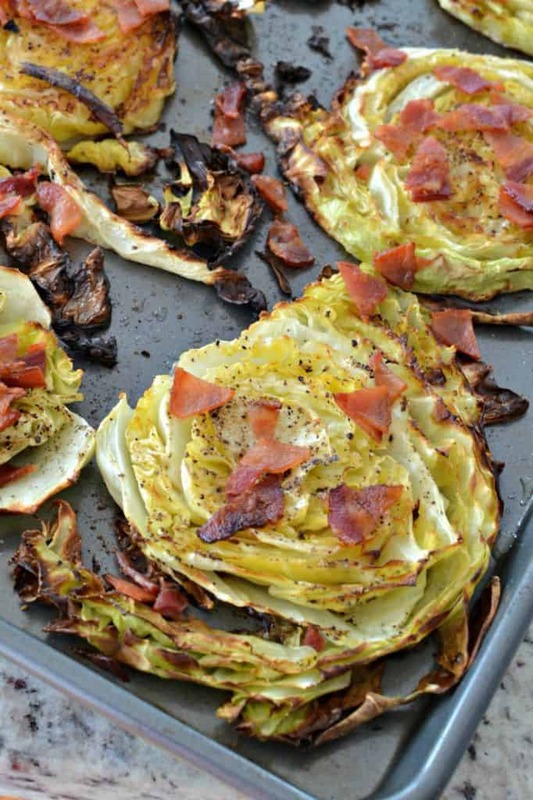 Other cabbage recipes you will love! Cabbage Steaks are a delectable easy low carb side option that can be served with chicken, beef or fish. They can be prepped and in the oven in minutes. Preheat oven to 375 degrees. Place bacon on very large baking sheet. Bake until crispy; approximately 15 minutes. Turn halfway through. Remove from baking sheet and place on paper towels to drain. Do not wash baking sheet. Raise oven temperature to 400 degrees. Cut the stem off the cabbage and slice into 3/4 inch steaks. 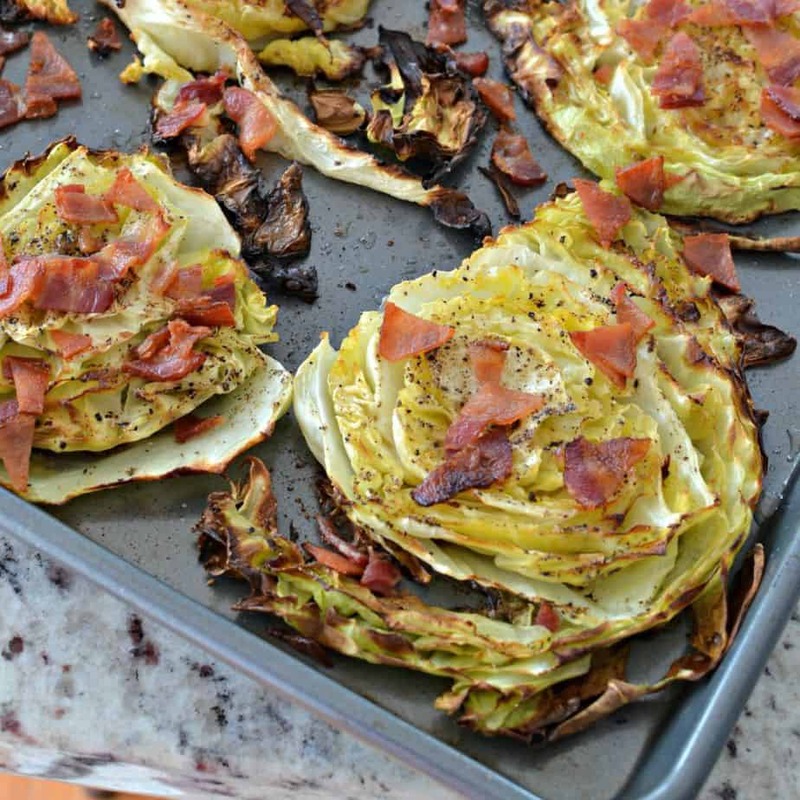 Place the cabbage steaks on the baking sheet on top of any bacon grease. 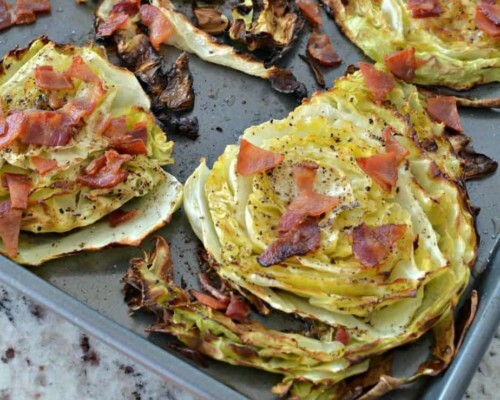 Drizzle the cabbage with olive oil and sprinkle with salt, pepper, onion powder and garlic powder. Bake for 20-25 minutes until crispy on the edges. Coarsely chop bacon. 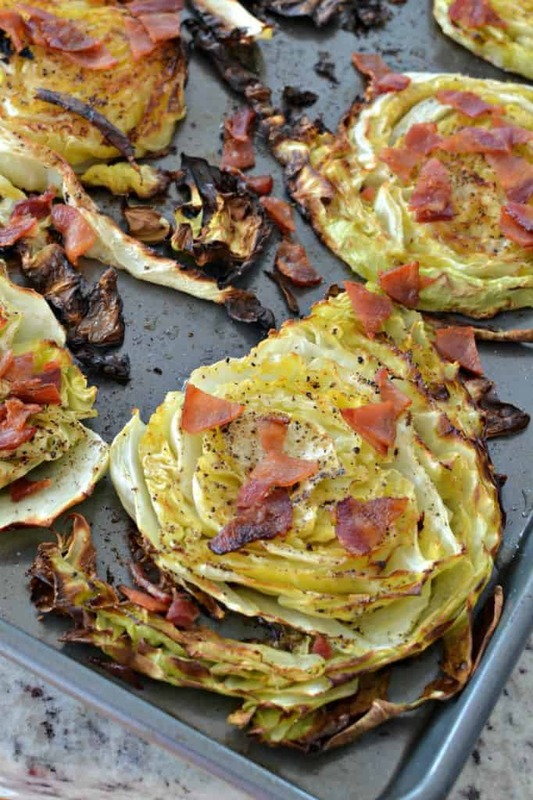 Sprinkle over the cabbage and place back in the oven for 2-3 minutes. Serve as soon as possible. One large head of cabbage makes about 6 large steaks and 2 smaller ones. At what temperature do you bake these cabbage steaks? 400 degrees. It is in the recipe. I hope you enjoy them!